A few weeks ago, I bought my first "adult" piece of furniture: West Elm's rustic expandable farm table, made from reclaimed pine. Since moving into my new house, I had spent months pining after the table, admiring it online and in person at the West Elm store a few blocks from my office. Finally, when it went on sale, I took the plunge and bought the damned thing. Because truth be told, I'd been less than satisfied with my house ever since I'd gotten the keys and finished filing the papers. Once the initial novelty of home ownership had faded away, I was left with reality: an old house filled with incredibly dark rooms, falling door knobs, and a whole load of buyer's remorse. And it didn't help that my furniture seemed to make a mockery of the old house. Like every young, frequently mobile 20-something, I had furnished my house with the cheapest of the cheap Ikea furniture: the $19.99 Lack coffee table and the $49.99 Fjellse bed frame, for instance. While it worked for the ratty apartment buildings that I had previously lived in, it clashed horribly with the house's original doug fir wood floors and dramatic bay windows. I frequently joked that my house was like a parody of an Ikea catalogue; that is, despite the fact that everything was from Ikea, it all looked terrible. But I was convinced that this table was going to be the heart and soul of my new house. It was my first piece of furniture that was a) not from Ikea and b) cost more than the minimum amount that you could pay for a dining table. I was so excited about it that I even spent the afternoon working from home so I could oversee its delivery. And as the packing tape unravelled and we finished playing around with its position in the dining room, I stood back to take it in. However, instead of seeing the table that I coveted for 6 months, I saw everything else that was wrong with the picture. The fact that I needed chairs to go with the table. Or the overhead lighting fixture was too dim and mismatched everything in the room. And most obviously, howthe dining room's wood panels were just too damn dark and needed a lighter touch. I nearly burst out crying. There was just too much work, and too little money to do everything that I wanted to. As I was retelling this story to a friend, she nodded sagely. She was a slightly older than me, and had bought her house with her husband a few years earlier. "You know, Michelle," she said in a gentle tone. "It takes more than nice furniture to turn a house into a home." I rolled my eyes and changed the subject. Later, as I was cleaning the new dining table, I carefully wiped a washcloth over a panel of its beautifully distressed wood and jumped back — the wood had caused a large splinter to go up and into my finger. I cursed loudly and unceremoniously yanked the giant shard out of my finger, causing it to spray droplets of blood everywhere including precious new white tablecloths for my food photography. I cursed again and ran to the kitchen to rinse them under scalding water, burning my wounded hand in the process. With my hand burning under the sink, I thought to myself that this would make a great story for the blog. Of course I spent 6 months pining after a ridiculously expensive/artfully distressed table, only to have it impale me and essentially beat me up within 5 minutes of ownership— with that thought, I suddenly understood what my friend had said earlier. My friend was right. At the end of the day, a measure of a home isn't defined by the number of expensively distressed furniture in it. Instead, it was these ridiculously banal stories and moments ("Hey guys, remember that time this table gave me a splinter?") that were eventually going to lead me to turn this house into a home. When it first came out of the oven, I knew it wasn't going to be a looker. 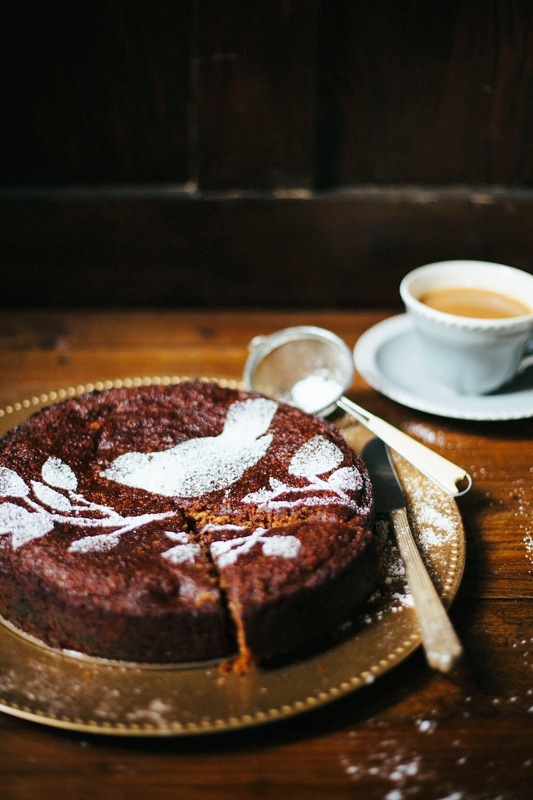 The cake is held together primarily by dates and coconut flakes that have caramelized in the oven — although this does wonders for its flavor, it doesn't do so much for its appearance. But with a little creativity (that is, placing a stencil over the cake and dusting powdered sugar over the stencil), it came out beautifully. And hopefully, I'll have another inspired moment like this and create something for my house. Because maybe that's all it needs to be beautiful too. Just small efforts like this to unearth the house's hidden beauty. Well... that and a few more splinters in my finger. Then I'll really be able to call it home. This cake is based off the lumberjack cake at Frances, one of my favorite restaurants in San Francisco. 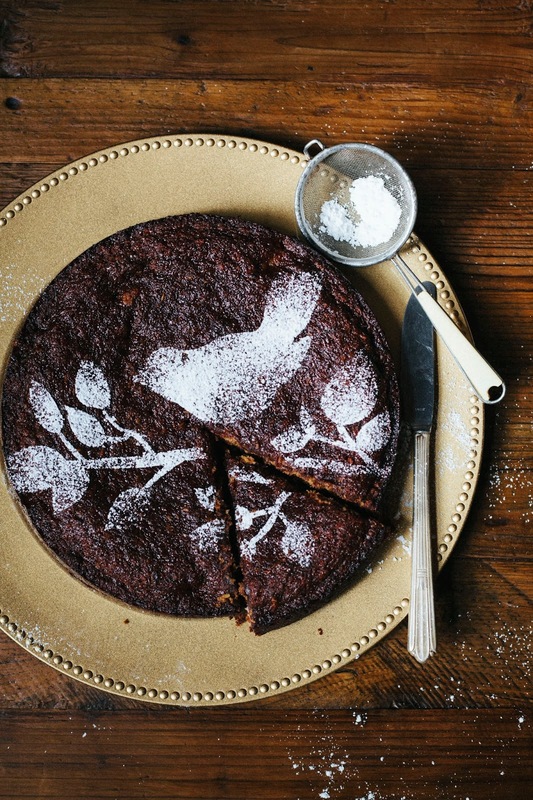 It's a deliciously complex cake that's made from really simple ingredients — pear, dates, and coconut flakes are its the star ingredients. During the baking process, the dates and coconut flakes caramelize and create the cake's wonderful toffee flavor. 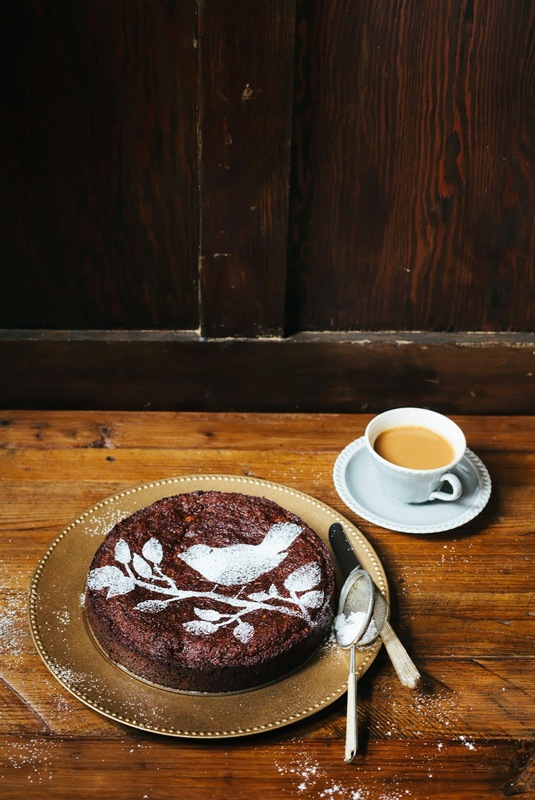 As an added bonus, the cake doesn't require as much refined sugar as other cakes on this blog because the fruits' natural sugar is more than enough. Using a good, ripe pear that retains its shape and doesn't get mushy during the baking process is also key to this cake. I recommend using Bosc pears. There is a weird step in this recipe, in which you bring pitted dates to a boil and then whisk in a teaspoon of baking soda. It causes the entire solution to bubble violently. Just go with it. It's going to a produce a really unattractive dark mush that smells kinda bad, but it ends up tasting alright in the cake. I promise. Because the cake is a dark brown/golden caramel color, it's hard to tell when it's finished baking. 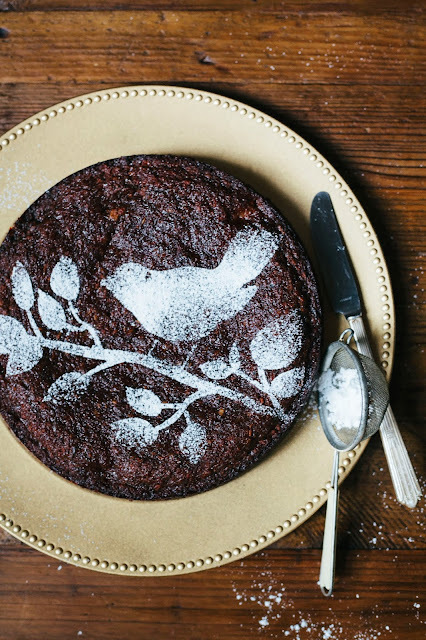 If the cake looks incredibly brown, don't panic and pull it out of the oven too early — this dark brown color is normal and is a result of the pears and coconut flakes achieving their melty, caramelized goodness. Make sure you use a full sized skewer to test the cake — when the skewer comes out clean, the cake is finished baking. So a lot of you guys are probably wondering how I got the powdered sugar bird and branch on the cake. 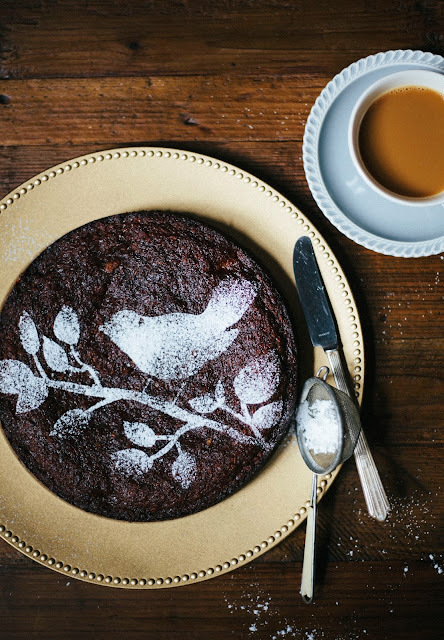 Easy as pie — I bought a stencil from the craft store (specifically, this one), put it on top of the cake, and then sprinkled powdered sugar on top of the stencil. I gently lifted up the stencil and was left with the beautiful powdered sugar design you see on top of the cake. Boom! I'm an artist now. Of course, you can make your own stencils too, but I'm not that creative. Preheat the oven to 350 (F) and prepare a 9-inch springform pan by greasing liberally with butter or spraying generously with cooking spray. In a medium, heavy-bottomed sauce pan, combine 1 cup water and 1 heaping cup pitted dates. Bring water and dates to a boil over medium heat, whisking the mixture occasionally. Once the mixture is at a gentle boil, whisk in 1 teaspoon baking soda and immediately remove from heat. Continue to gently whisk the mixture for 1 minute, before setting on a wire rack to cool completely. In a small bowl, whisk together 1 1/4 cup all-purpose flour, 3/4 teaspoon baking soda, and 1 teaspoon salt. Set aside. In the bowl of a freestanding electric mixer fitted with a paddle attachment, combine 1/2 cup unsalted butter and 1 1/4 cup granulated sugar. Cream together on medium speed until light and fluffy, about 5 minutes. Once the mixture is light and fluffy, turn the mixer speed to its lowest setting and add 1 egg. Continue mixing until the egg is completely incorporated, before adding 1 teaspoon vanilla extract. Continue mixing on low speed and slowly add the cooled date mixture (from the 2nd step), before slowly adding the flour mixture (from the 3rd step). Mix on low speed until just combined — DO NOT OVERMIX or your cake will be tough and I will cry for you. It's okay to have one or two small flour streaks left. Once the dry ingredients have just been incorporated, sprinkle 1/2 cup coconut flakes evenly over the top of the batter and use a rubber spatula to gently fold the coconut into the mixture. Add diced pears, and continue to gently fold into the mixture. Transfer the batter into the prepared springform pan and bake in the preheated oven for 45 minutes. Once the cake has baked for 45 minutes, rotate the pan in the oven and continue to bake for another 10 minutes. Insert a clean skewer into the middle of the cake, and if it comes out clean, the cake is done. If not, rotate the pan and continue to bake in 5 minute increments. Once the cake is ready, allow to cool on a wire rack for 15 minutes before serving. This cake is amazing when served fresh out the oven! Sprinkle 1/3 cup confectioner's sugar over the cake when ready to serve. I've lived in many houses, but only a few have really been "home," and that is far more because of the people and life lived there than the possessions. I think this is one of my favorite of your posts, Michelle. I do love that stencil - I may have to break down and get one. Very eye-catching, and it could come in very handy. So maybe I didn´t read it right, although I went through it twice… but at what point do you add in the date mixture that you boiled up to begin with? I´m guessing it would be before adding in the flour? p.s. the Captcha spam catching hoops I´m having to jump through just to publish this comment are just too frustrating! Oops, my goodness, I can't believe I forgot such a key step! You add the date mixture to the sugar and egg mixture before you add in the flour mixture. I've changed the recipe above and in the print version to reflect this. Thanks for pointing it out, and sorry about the Captcha stuff. It's just that when I don't have it on, I get so much spam. Love this post, and that cake...? Too beautiful to eat! This is so true and I can totally relate to that feeling of being disheartened when the reality of owning a house (that is not quite a home yet) sinks in. You're right though, it really takes living in a place to make it into a home. Such a great post and such a delicious looking cake. The photos in the post are really stunning. What a stunning stencil design on that cake and as for the flavours? So good. We've been in our little flat for nearly four years now - how time flies! Lovely! I'm going to try making this soon. We recently sold our condo, brand new when we bought it, and purchased a 1969 ranch earlier this year that hasn't been updated since then. The biggest thing I have had to wrap my mind around is that it doesn't happen overnight, one day your home will become the vision you have in your head, I know our house is probably 8-10 years of getting it to be whee we want it but I trying to focus on the journey instead of the destination. On another note this cake looks and sounds delish. The cake is so unique and gorgeous! Also, a house is always a lot of work and you'll probably never quite be satisfied with it, but it's still awesome. There's no better feeling than having a home to go to at the end of the day. This is unbelievably beautiful! LOVE it! Is ground coconut flakes the same as desiccated coconut? Yep! Just make sure they are unsweetened.